Grilled cheese sandwiches just got a whole lot better! These grown-up bacon grilled cheese sandwiches are filled with caramelized onions, bacon, and gooey cheese. How could it get any better? When making these bacon grilled cheese sandwiches, first you will want to cook the bacon. Then, you will want to slice the tomatoes, and third you will need to chop the onions. The next step would be to saute the onions. So, in a small frying pan, add the 3 Tbsp of butter and the chopped onions. Cook on medium heat, stirring occasionally until the onions start to carmelize. Now, back to the directions you are probably used to when it comes to a grilled cheese: spread butter on 10 slices of bread on one side of the bread only. Then, start to assemble. You will place a buttered bread, butter side down in a large frying pan and add the cheese. Then add the sauteed onions. 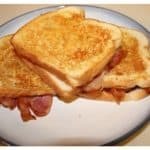 Next, you will place two slices (or more depending on how many you would like) of bacon on top of the onions, followed by the tomato slices and the final slice of bread. You will then cook this on medium low heat until both sides are just golden brown.